Authored by piggz on Mar 30 2016, 9:56 AM. Printed report from Kexi with custom size to PDF. Seems to work ok.
piggz retitled this revision from to Add support for custom page width/height. @piggz What's the status for this commit? Lines 214, 215 to long, break them. 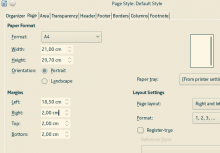 Let's use QPrinterInfo::defaultPrinter().defaultPageSize() as the default. Let's have custom-page-size property (tr("Custom Page Size")) of type SizeF. TODO: later let's have this default unit defined somewhere in a single place. TODO future idea: If p is page size or custom page size or margin, and the margin is too big let's change margin (one or both) so the effective page area is at least 5mmx5mm. remove or disable debug here and elsewhere..
Any chances to make basic improvements and push it for 3.0.0? Is it good time to remove this code? 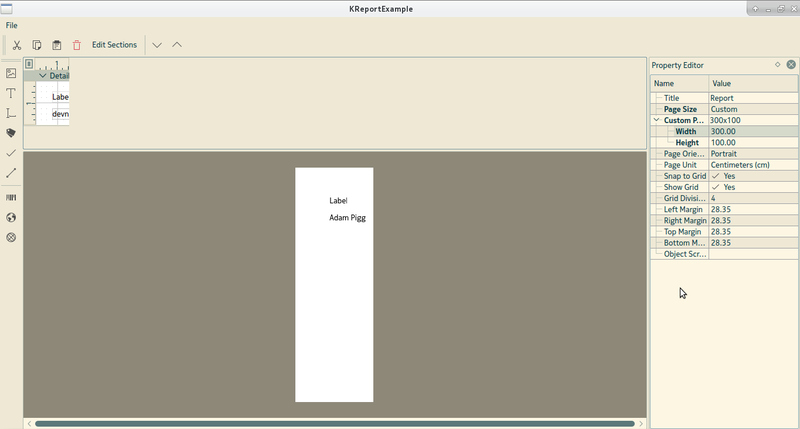 When changing page CustomPageSize->Width property in the KReportExample's property editor, it is interpreted as Height. And coversely, Height is interpreted as Width. Well ... that is maybe me trying to be too clever ... because the orientation is portrait, it tries to interpret the width/height appropriately. Thoughts about how this should work? 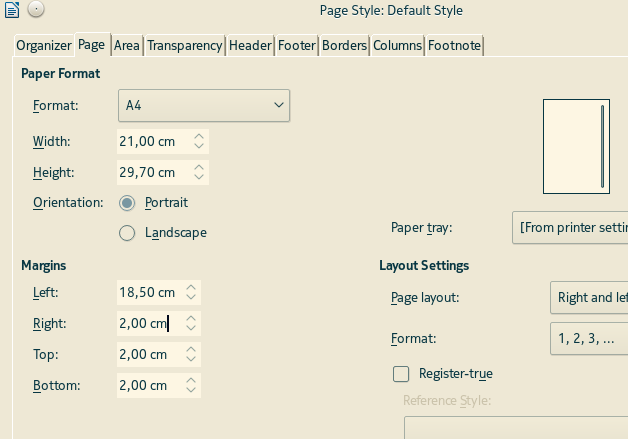 Returns the page size of the page layout. Note that the QPageSize is always defined in a Portrait orientation. To obtain a size that takes the set orientation into account you must use fullRect(). So how about the customSize property be like that? Orientation could be taken into account just prior to drawing/event handling. So comparing pageWidth with pageHeight in order to modify orientation would be not needed. If user changes orientation, effective page size changes too regardless the size being custom or A4 or whatever. Probably most of the logic is in place already since we're using QPageLayout already? On loading from XML we're calling d->pageLayout.setPageSize(custom) which really assumes size is a logical size regardless orientation. Do we need toSize() here? QSizeF is accepted in the ctor. QSize is used to gice size in POints .. QSizeF is used when units are specified. The ctors are different. QPageSize::Point, ...) is not more accurate?